It’s sad when a person of the cloth—a religious leader—preaches hate instead of love. When Florida pastor Terry Jones publicly burned a Quran it was a hateful act, but we could minimize its significance as an act by a pastor to a “congregation” of 5o people (his claim). Robertson’s Christian Broadcasting Network claims a reach of 100 languages, 200 countries, a million viewers a day. 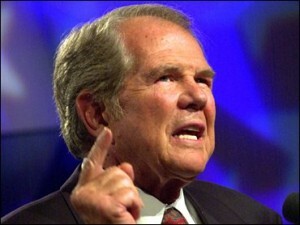 His hatefulness is a blot on all Christian evangelists who tolerate his ugly message. This entry was posted on June 1, 2011 at 10:04 pm and is filed under Ethics-general, Religion, Tolerance. You can follow any responses to this entry through the RSS 2.0 feed. You can leave a response, or trackback from your own site.